A WORLD OF ICE AND FIRE Releasing TODAY! The long anticipated release of the official untold history of Westeros happens TODAY. It boasts 300 pages of back story and original artwork by the some of the world's top fantasy illustrators. This one-of-a-kind coffee table book contains maps, folk lore, detailed family histories, and endless insider information dealing with the world of Westeros. Providing vividly constructed accounts of epic battles tackled by famous heroes, and their journies before becoming important figures in the Song of Ice and Fire series. 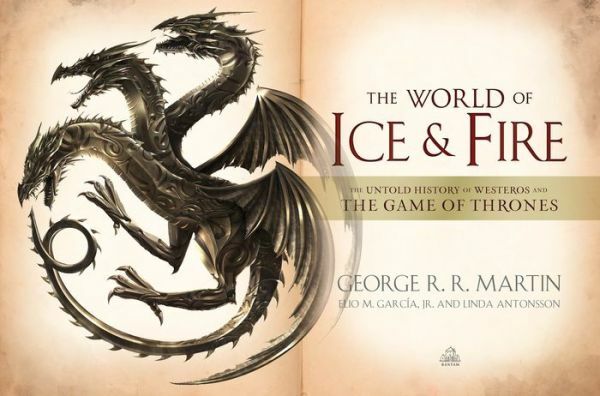 Co written by the illustrious Elio Garcia and Linda Antonsson masters of Westeros.org, the World of Ice and Fire is a true insiders perspective on all things Westeros and a little bit of Essos too. I'm expecting mine to show up on my doorstep any minute now. I know what I'm doing this evening. This new tome, my favorite chair and a glass of Dornish Red are involved! Great news indeed. I pre-ordered the book almost a year ago, and finally got it today. Thanks a lot! One thing I was hoping to find in it was the official chronology of events in "A Song of Ice and Fire" books. Alas, it wasn't there. Is there any hope that one day it will be published? Big day for you George. I know you have been talking about this book for close to 10 years now, and working on it...who knows. I know it's not Son of Kong, and you completed your part a while ago, but seeing this book released must be relieving to have another (slightly larger) monkey off your back. This is beautiful, I own two first editions of A Game of Thrones that I picked up in two separate charity stores years ago. From that moment, long before HBO, I was hooked! This is really a great addition. Very excited. Love fake history! I've had it pre-ordered for a long time. Very eager to see how this project turned out. No doubt it'll be well worth the wait, as with all things Ice & Fire. Great book, fantastic (and I mean fantastic) art! About 50 pages in, required reading for the completist or (in my case as an archaeologist) 'history' buffs! I just made my own LiveJournal account after seeing the video. I just wanted to say that the scene in the background of Torrhen Stark kneeling on the banks of the Trident (I believe), and other preview images I have seen all look like the kind of art I would want on my wall, in a gallery even. Are posters of these pages being released as well? I also want to give you my compliments for the A Song of Ice & Fire books, which have been brilliant thus far (I haven't gotten a hold of all of the prequel stories as I can't find them in the local bookstores). Obviously I can't wait to see The Winds of Winter, but as a complete and unrushed product. Preordered it at Amazon.de and got it today. A shame the book I got was damaged, so I have already wrapped it up again and ordered a replacement. It looked really great at first glance, but I obviously haven't seen much more of it. I can't wait to get the replacement. I am flipping through it right now and this is just... gorgeous! More than worth the price. I will treasure this forever! George!!!! I cannot believe how gorgeous this is. OMG! You weren't kidding, and honestly, you undersold how insane this really looks. I watched the video from 92y (im in NY, but couldn't make the event), and even seeing some of the artwork ahead of time did NOT prepare me for what this thing was really going to be like. Even the binding is top notch! Wonderful!